Workspace in need of an upgrade? If you want something pretty that also helps aid office productivity, you can't go past a touch of living greenery. Much like indoor plants help beautify the home, they also make the office a much more pleasant place to be - transforming it from sterile to inspirational. There are known benefits to office plants, too, outside the aesthetic. Multiple studies have shown that the presence of indoor plants inside office spaces helps to increase productivity, improve mood and wellbeing, drive down levels of stress and illness and improve cognition and concentration. 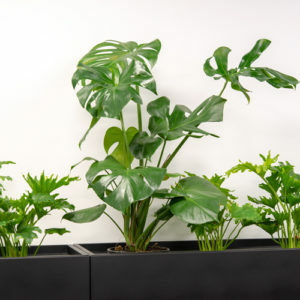 Many indoor plants have also been shown to possess air purifying capabilities - an excellent attribute in an office filled with people and recycled air! In addition, living indoor greenery when carefully selected is less likely to trigger anyone's allergies or respiratory issues than cut flowers, which may shed pollen. Ready to green up your working space? We've got some ideas to share. 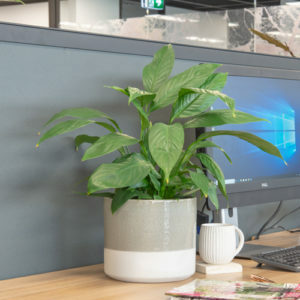 When you're choosing plants for your office space, Justyn Taylor, Flower Power's resident expert Plant Buyer, says there are a few major factors you should consider. The first is lighting. While more and more office spaces are designed to let in natural light, generally speaking your office plants will need to withstand relatively low levels of light - so a plant that requires full sun is a no-go in the office. Rainforest plants are always a safe bet as their natural habitat is one with low light. If plants are left in unused spaces, it's important that the lights go on for at least a few hours each day. The second consideration is care needs. A plant requiring daily watering is perhaps not the best choice for an office space, as your plants will go thirsty on weekends, public holidays and through any holiday closures. Choose plants that are drought-tolerant and can therefore withstand short to moderate periods without watering. The third major consideration is temperature. As offices generally hover around 22-23C, choose plants that cope well with lower temperatures and dry air. Heat-loving plants need not apply! Once you've narrowed down your plant list based on these factors, pick your final combination based on the look and feel you want for your office. Spathiphyllum Sensation Junior - a fabulous office plant choice. When people think of indoor plants, the first thing that comes to mind is usually a spathiphyllum. Why? Because they are easy to care for and add lots of simple greenery, plus a touch of fresh white with their beautiful flowers! Spathiphyllums are also great air purifiers, making them a fantastic option for the office. These plants like regular watering, so pop one on your desk - you'll see it every day and remember that it's thirsty. We're fans of all spathiphyllums great and small, but for our office situation, we chose two very specific varieties - Domino for the striking marbled look of its variegated green and white foliage, and Sensation Junior for its upright growth habit and broad, glossy leaves. Like to learn more about this indoor classic? Click here. Ficuses are hugely popular, and for good reason - they're great statement plants that are relatively hardy indoors. These plants do tend to like a bit of light, so we suggest you utilise them in a position near a window and away from the direct path of any air conditioning vents. We've popped them in our reception foyer in some stunning statement pots. This way, they create an immediate visual impact and set an impressive tone for visitors. With over 850 diverse varieties to choose from, the ficus family is full of fabulous indoor plants. We chose the long-leaf fig (ficus sabre) and fiddle-leaf fig (ficus lyrata) for our office to create a beautiful foliage contrast, as their leaves are so very different both in size and shape. Want some tips on caring for your indoor fig? Here's a great article. Sansevieria Silver Sword surrounded by Birds Nest Ferns. These iconic and hardy plants grow tall, especially in our chosen variety Silver Sword, making them a great option for creating a privacy screen in your office. By popping them in planter boxes set on top of small storage cupboards, you can create the feel of an isolated area while still allowing and encouraging collaboration and airflow. As far as watering goes, this plant only gets thirsty when its potting mix is completely dry, meaning it's a great low-care option perfect for the office, as a weekend without water won't be a problem. Interested in sansevieria as an option for your office? Click here to learn more. One thing we love about indoor plants is the diversity of colour you can find in their foliage. This is particularly evident in the trailing tendrils of Devil's Ivy dotted throughout our office. By pairing it with taller plants like spathiphyllum and sanseviera, you can create an intricately layered look - plus the bold variegation in our chosen variety, Marble Queen, adds texture and dimension. We chose to use our attention-grabbing Devil's Ivy plants like bookends on our feature planter boxes, meaning that as you approach them, they're the first thing you see. We also used them to underplant our statement long-leaf fig in the reception foyer. Monstera is a great feature plant. Here it is contrasted against Philodendron Lickety Split. For iconic, statement foliage it is impossible to beat the monstera - and from canvas wall prints to oversized statement earrings, you can hardly walk into a shop in 2019 without seeing monstera leaves. We incorporated this trendy motif in living form, so that not only do we get to look at its gorgeous Swiss-cheese foliage, we get to experience the benefits of having living greenery in our midst, too. As it's quite a large grower, monstera works best as an office feature rather than a desk plant. We alternated ours with philodendrons for contrasting colour and texture along a wall in a hallway, creating a vast expanse of green texture. Philodendron is an excellent choice if it's foliage you want - and our featured variety, Lickety Split, is particularly fun. With glossy, bright-green leaves in a split and ruffled style, this hardy and tolerant plant brings texture in spades and plays beautifully off the monstera we've paired it with in the hallway feature. A word of advice, however - if your office is pet- or child-friendly, be sure that you keep this plant off the ground and well out of reach, as it can be poisonous if ingested. A Duffy Fern living happily on a desk corner. Ferns are a classic pick for indoor use - and for good reason! From lacy maidenhairs to broad-leafed bird's nests, there's a fern to suit every style, adding delicate texture or bold green foliage. 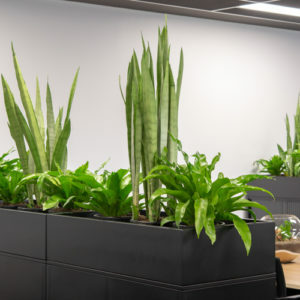 As rainforest plants, ferns can withstand low-lighting conditions which makes them ideal for offices where they may not receive a great deal of natural light. 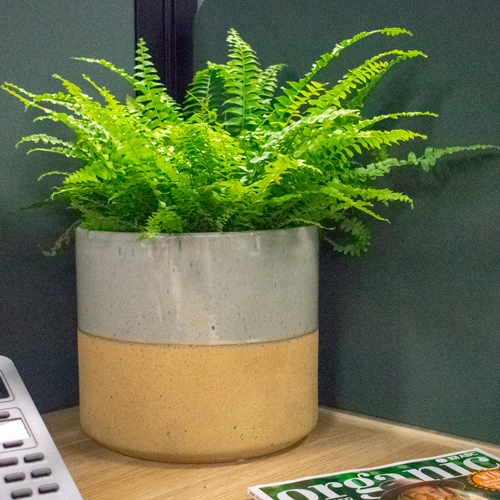 For use on desks, we went with the Duffy Fern, a small-growing relative of the Boston Fern with sword-shaped fronds carrying small and delicate serrated leaves. In our privacy screens, we went with the Bird's Nest Fern (asplenium antiquum) - a dense, broad-leafed variety that works with the Sansevieria we chose to create the sense of levels. Keen to hear more about caring for ferns? Click here for a great read! For statement pieces in communal spaces like kitchens and meeting rooms, it is difficult to go past a terrarium. Our gorgeous Living Trends range offers a range of sizes and styles, so there's an option to suit all spaces, large and small. Even better, our stylish and modern Living Trends terrariums are lovingly created and layered by hand, so no two are identical. They're also relatively low-maintenance as far as their care needs go, especially if they're succulent-based, making them perfect for a meeting room which may not always be occupied. We went with extra large round terrariums to create a real focal point, but you can always choose a different size or shape to better suit smaller spaces. Want to learn how to care for your Living Trends terrarium? Click here.